I was recently called in to tame three mustangs. The gelding was as wild-eyed as a march hare and wouldn't come within fifty feet; the mare was belligerent and spooky; the bottle-fed baby was a sweet-heart... until it decided to bite, kick, or chase its keeper. Two trainers had already quit. Beginning here, I'll show you, step-by-step, what I'm doing to turn these three into model citizens. Know that everything I'm doing, you can also do yourself if or when you find yourself in a similar situation. 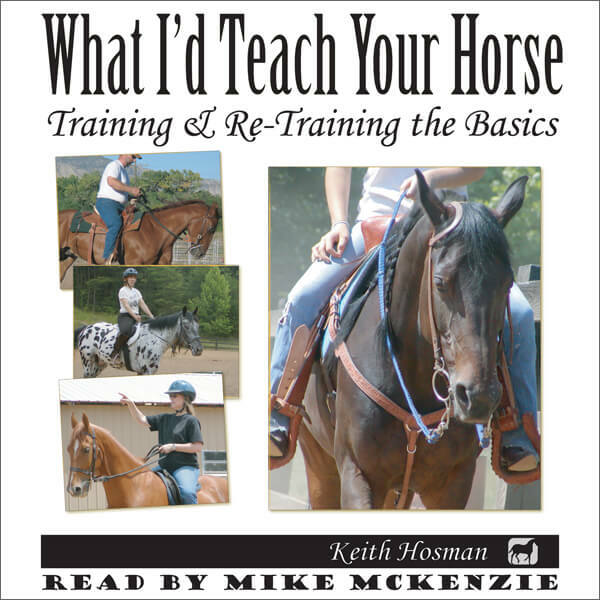 Hear "What I'd Teach Your Horse"
Now on audio! Listen on your smart phone... in your car, at the barn, or as you workout! ​"Your Foal" on audio, too! The more impossible your own situation, the more this series of articles is for you. This series is not for the typical horse-owner. This is for those few who face exceptional challenges. Here I'll outline one of the toughest challenges I've ever faced: I couldn't use a roundpen, the horses were buddy sour to an extreme, we were surrounded by barbed wire and otherwise poor fencing - and I couldn't get within a football field of the gelding. This series is about ground work for the completely wild horse. It's not for overtly dangerous horses (the type that might charge you, for instance), nor is it the route I'd take with the average horse I meet. Note also that it does not cover any aspect of riding. If trainer after trainer has refused to "break" your horse because the horse is wilder than a jack rabbit, this is training you can do yourself so that eventually a real pro can take over. Remember, if I can do this, you can do this. Make free use of what follows, mix and match, throw in a whole bunch of time, patience and common sense - and in short time you'll make friends with that horse of yours, the one that you couldn't touch yesterday.